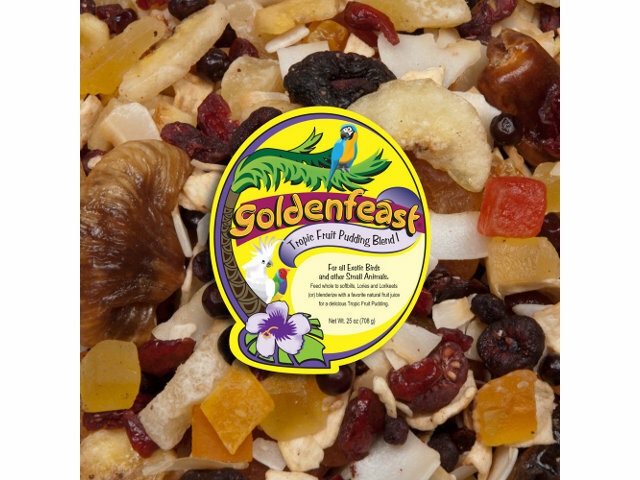 Goldenfeast Tropic Fruit Pudding Blend 1 bird food contains very large human grade dried fruits to serve whole to larger birds. Can be chopped or blenderized for smaller bird species. Add a favorite natural fruit juice and blenderize to produce a delicious "Tropic Fruit Pudding". Papaya dices, mangos, bananas, dehydrated apple flakes, cherries, flaked coconut, pineapple discs, apricots, cranberries, strawberries, whole Calimyrna figs, whole Turkish dates, dried plums, dehydrated peaches and dehydrated blueberries.